With 11 days to go till Echoes of Olympus Mons comes out, I decided to do a series of 11 mini-blogs about the most terrifying places in our solar system. Each day, I’ll be focusing on a different part of our solar backyard. 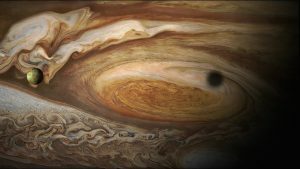 Today, I’m focusing on the hydrogen sea that is thought to exist deep within the largest planet in our solar system, Jupiter. There’s no secret that there’s plenty of hydrogen in Jupiter’s upper atmosphere, and it exists much in the same way as it does on Earth in those upper levels. But, deep within the planet, it’s a different story. Deep within the planet, near its core, the atmospheric pressure is so great that it turns the gas into a dense fluid. This creates an ocean of metallic hydrogen. Imagine a liquid metallic ocean, so deep within the planet that the only light you see is from gargantuan lightning bolts, slashing across the dark clouds above. 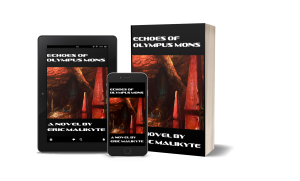 I don’t think anyone wants to think about what would happen to a human body if it were to be exposed to pressures strong enough to turn hydrogen gas into a liquid metal…well, I do, but all you have to do to figure out why is read Echoes of Olympus Mons, coming out in just 11 days! You can get the Kindle edition for 25% off by pre-ordering now! Tomorrow, we’ll be talking about a certain super volcano. And guess what? It’s right here on our own planet!